Title: 04/04/1995 - Health effects of prolonged exposure to paint related materials. This is in response to your letter of January 26, requesting information or literature regarding the health effects of prolonged exposure to paint related materials. There are many different formulas for paints, industrial coatings, primers, sealers, etc., and consequently, there are many different chemicals used to produce them. 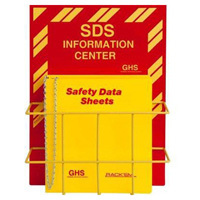 Therefore, the Occupational Safety and Health Administration (OSHA), Technical Data Center (TDC), did a wide ranging search for any technical literature that may associate brain, nerve, or kidney damage with exposures occurring during painting operations. We have enclosed the abstracts of the literature the TDC located. Also, please be aware that the OSHA Hazard Communication Standard, 29 CFR 1910.1200 (copy enclosed), requires the manufacturer OR importer of a hazardous paint to conduct a hazard determination and to prepare a material safety data sheet (MSDS) for the paint and to provide the MSDS to employers who use the paint. If your husband or his employer(s) know the identities of paints that were used, the MSDSs for them may be helpful to you. We hope you find the information helpful. Should you require additional information, please contact the OSHA TDC at (202) 219-7500. I need information and or literature regarding prolonged exposure to paint (hazardous) related materials such as solvents, lacquers, ceramic tile primer concrete sealer, etc. too many to list. My husband was a painter for 20 years. He has done just about all types of painting from industrial steel, high rise, auto you name it, he's done it. He now has a lot of health problems. Brain, nerve and kidney damage. He has not worked for about 4 years, due to this and has been on nerve medication for 5 years. His condition is getting worse. Do not have money to see doctors. He has applied for disability and we need more facts about prolong exposure to hazardous paint materials and their side effects.